…so we are looking for a good spot to park it. What do you think? Where would you like to see a car(s)? As a thank you, we will enter everyone who completes the survey into a prize draw on 21 March. The prize is £10 Co-wheels driving credit. 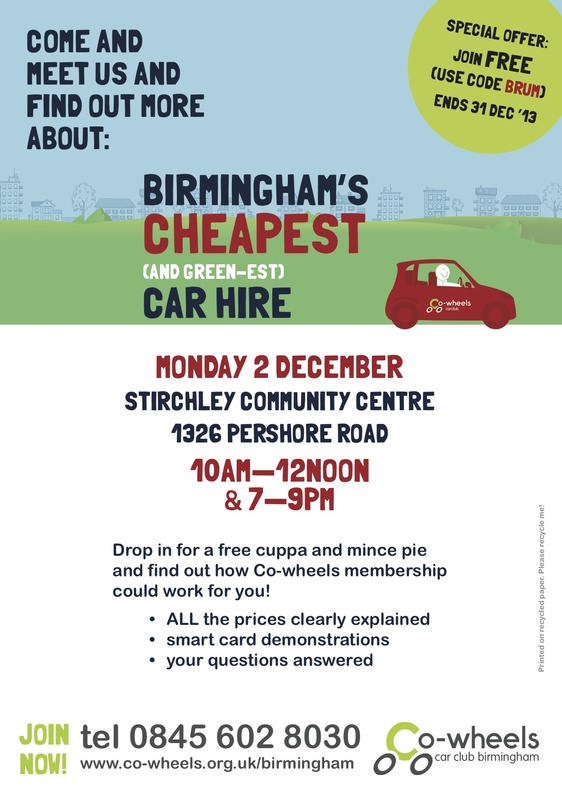 We are having two drop-in sessions on Monday 2 December 10am—12noon & 7—9pm, at Stirchley Community Centre 1326 Pershore Road. Drop in for a free cuppa and mince pie and find out how Co-wheels membership could work for you! 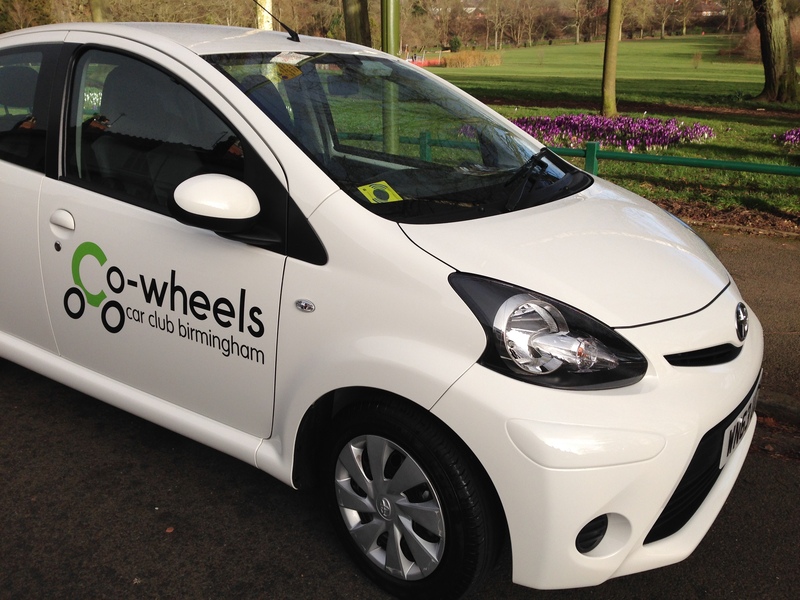 Co-wheels Car Club are the cheapest (and greenest) car hire in Brum and all our profits go towards our vision of clean air, safe streets, healthy lives. All welcome: please forward to your networks and contacts. Thank you! Congratulations to @CycleSouthBrum who won the most-vosted-for-runner-up in the #pplsmillions this week! Thank you to everyone who phoned up to vote. The £50,000 will be used to set up a cycling hub, with free bikes, maintenance, led rides… Green Revolutions are absolutely delighted with this result! We’ve done the research so you don’t have to (and some of it involved burrowing deep into some tiny small print). 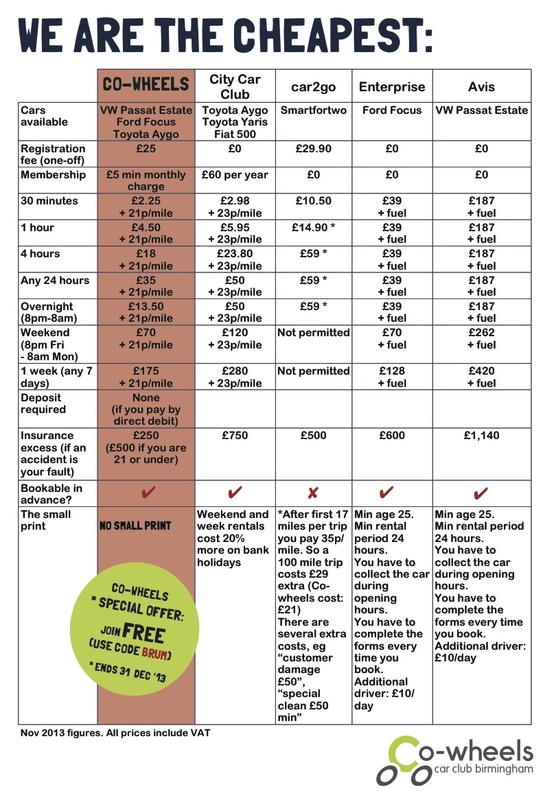 As you can see from this chart, Co-wheels are overall the cheapest car hire in Birmingham. Not only are we the best for hourly rates and mileage charges, we have the lowest insurance excess and NO SMALL PRINT! This is a brilliant opportunity to increase cycling in our area. The project is through to the head-to-head final of ITV1’s Peoples Millions and voting takes place on Tuesday 26th November. The winner will get a £50,000 grant to make it happen. Ask your friends, colleagues, family – in fact anyone who has a phone – to do the same. Vote as much as you can on Tuesday. You can vote up to 10 times from the same number. Calls cost just 11p from a landline. Watch the video clip on central 6pm on ITV1 (look out for Green Revolutions bods on our bikes with 2 year old Arthur) and be inspired!